If you’re looking to hire a vendor, submit a request for quotation in the relevant industry you are looking at. Alternatively, you can use the ThunderQuote Sourcing Tool to help you determine the scope of your project. One key advice to submitting a request is to be specific as possible, so that vendors are able to give you the most accurate quotation. 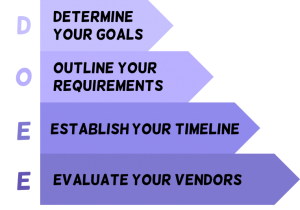 Clearly state your project goals and requirements and establish a rough gauge of your timeline. If you wish you find out more tips about Outsourcing, you may download our free e-guide about good outsourcing techniques. Check on the status of your requests and review the list of the vendors who have submitted quotations. Clicking on the name of the vendor will give you access to their Vendor Account profile, a comprehensive page of the company and company’s portfolio. For a comprehensive evaluation of your vendors, contact them directly and arrange for a meeting. Alternatively, you may indicate dates and times where you are free to arrange an appointment with vendors on our platform. We will then inform new and existing vendors to sign up for these slots. Once you have decided on a vendor to work with, remember to indicate on our platform which vendor you hired! How do I submit a request for quotation? How long will it take for me to receive a quotation? On average, you can expect to receive a quotation (or quotations) within 72 hours of submitting your request. I have received 5 quotations. Now what? Check on the status of your requests and review the list of the vendors who have submitted quotations. Clicking on the name of the vendor will give you access to their Vendor Account profile, a comprehensive page of the company and company’s portfolio. If you have not received a followup call or email from the vendor, you should reach out to him/her to follow up. Set up your vendor account profile and be as detailed as possible. Buyers are more likely to trust your reputation if your information is readily available. You will need to make sure you have sufficient points before you can bid for your projects. Each point is worth USD$1. You can top up your points here. Alternatively, refer your friends to our website and receive free points! Now you’re all set to hunt for leads. While we recommend that you actively browse through our selection of leads, our portal will automatically alert you if a relevant lead comes through our portal. Focus on leads that you specialize in and make sure you send a customized message to your potential buyer as this will help you stand out amongst other vendors. You might also want to be quick when submitting your quotations, as requests will close once 5 quotations have been submitted. Note that each bid will cost you an administrative fee of 0.5% to 1% of the project’s total budget. So make sure you bid on only the projects you have confidence in winning! Reach out to the buyer through different means – emails, calls, SMSes. If the buyer is keen, meet up for coffee within 1 week of submitting your quotation. The key is to be persistent and to prove to the buyer that you are highly committed. Following up every week with new updates and ideas will help the buyer remember you. Remember to attach your portfolio to your emails as well to showcase your experience and products. It is good practice to prepare one portfolio that can be shared via e-mail, and another to share when you meet-up. Send an email with your portfolio, and if the buyer would like to meet to talk details, you can do some quick preview work for them. If the client likes your work but has a tight budget, it would be good to negotiate on features to come to a compromise. This would also build a good working relationship with the buyer, as they would feel that they are getting a good value. How do I bid for leads? First, you will need to look for leads that are relevant to you. Our portal will also automatically alert you if a relevant lead comes through our portal. Next, submit your bid and quotation for the lead. Each bid will cost an administrative fee of 0.5% to 1% of the total project. Ensure that you have set up your Vendor Account Profile. In your quotation, do include detailed description of past work that will make you appear reputable and help the buyer understand you better. I need more information from the request to make an accurate quotation. What should I do? For each lead, you may submit a Lead Clarification to obtain more information from the buyer. 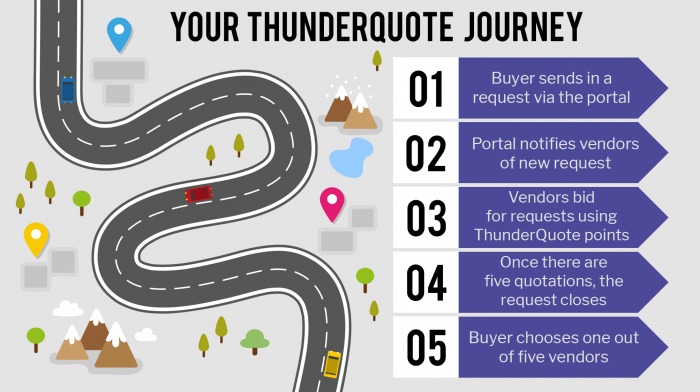 To prevent buyers from being spammed, your query will be forwarded to ThunderQuote directly. We will then compile all frequently asked questions and update you once we have received the relevant details from the buyer. What if the buyer does not respond to my quotation? If the buyer has not responded to your quotation on the portal, you may reach out to him/her via email or SMS as our portal verifies all contact information provided by users. Take note that this should be done at least within a week of submitting your quotation! How much does it cost to use ThunderQuote? Not only that, all new vendors receive free credits upon sign up. After which you can also refer other companies to sign up/submit RFQs and get more credits.